To Cite: Rezaei N, Nikbakht S, Ashrafi M, Rezaei Z, Mahdieh N, et al. Seizure as the Early and Main Manifestation of Infantile Vanishing White Matter Disease: A Case Report, Iran J Pediatr. 2018 ; 28(2):e65620. doi: 10.5812/ijp.65620. Introduction: Vanishing white matter disease (VWM) is considered as one of the most frequent types of inherited childhood leukoencephalopathies. Various neurological and non-neurological manifestations have been reported in this type of leukodystrophy; however, seizures are rarely described in infantile type of VWM. Case Presentation: To patient is a 12 months old boy who experienced frequent seizures at 4th month of age. The seizures were resistant to anti-epileptic drugs and caused 3 periods of hospitalization. Magnetic resonance imaging (MRI) demonstrated demyelinating pattern and whole exome sequencing (WES) reported homozygous mutation (c.922G > A) in EIF2B2 gene in exon 8 leading to an amino-acid substitution (p.Val308Met). Conclusions: Infantile onset of vanishing white matter disease can be considered as one of few childhood leukodystrophies that are associated with early onset seizures. Childhood leukodystrophies consist of various inherited white matter disorders with an incidence ranging from 1.2 to 3.01 per 100,000 persons/year (1). Vanishing white matter disease (VWM) is an autosomal recessive disorder and one of the most common types of leukodystrophies and engages all ages including antenatal, infantile, early childhood, late childhood, and adults (2). No data exists regarding the exact incidence of VWM; however, it seems that this type of leukodystrophy is more common in Caucasians. It has also been reported in non-white cases from South America and Asia. The molecular basis of the disease has been shown to be due to mutations in any of the five genes encoding subunits of eukaryotic translation initiation factor B (eiF2B). These genes are known as EIF2B1-5. EIF2B is considered as an important molecule which plays a significant role in the protein synthesis and managing the cellular stress conditions. To date, more than 110 mutations have been discovered in EIF2B genes; mostly recognized in EIF2B5, followed by EIF2B4 and EIF2B2 genes (3). The infantile form of the disease appears before the age of 2 years and usually is determined by hypotonia, progressive neurological deterioration, cerebellar ataxia, early onset cataracts, spasticity, fever and vomiting (3). Moreover, only few cases of early onset or infantile type of vanishing white matter disease with refractory seizures have been reported (2, 3). Here, we report the clinical and radiologic findings of a boy with infantile type of vanishing white matter disease who was presented with early onset serial seizures at 4 months of age. Molecular genetic evaluations indicated a mutation in EIF2B2 gene which confirmed the disease. The patient is a 12 month old boy who was born at term to a consanguinous couple with birth weight of 2550 grams and head circumference of 34cm. His parents brought him to a primary care physician at 2 months of age due to his poor weight gain. At 4 months, frequent seizures with staring, clonic movements of the left side limbs and truncal hypotonia developed. Therefore, the patient was referred to our hospital (children’s Medical center) for further evaluation. Neurological examinations did not show spasticity nor exaggerated deep tendon reflexes, but axial hypotonia was present. Neurological deterioration was not recognized. Awake electroencephalography (EEG) at age of 4 months showed tonic and focal seizures consisting of flattening of the background preceded by generalized and multifocal spike waves followed by diffuse slow waves. Brain magnetic resonance imaging (MRI) was performed at the time of seizure onset for further evaluation (Figure 1). Brain MRI transverse spin echo (SE) T2 weighted images at the level of midbrain and high parietal centrum semi-oval demonstrated diffuse abnormally increased signal of deep and subcortical white matter. In addition, bilateral higher signal of anterior temporal subcortical white matter in T2 weighted image compared to deep white matter suggested early cystic degeneration in these areas. Coronal SE T2 weighted image and T1 fluid attenuated inversion recovery (FLAIR) sequences at the level of posterior limb of internal capsule and dentate nuclei indicated diffuse supra and infratentorial white matter increased signals which were relatively low in T1 FLAIR. Overall findings were consistent with severe demyelination of white matter. We considered a demyelinating type of childhood leukodystrophy as the probable etiology for the clinical scenario of this patient regarding to MRI pattern involvement, early onset refractory seizures and global developmental delay. Seizures of the patient stopped with intravenous anti-epileptic medications and he was discharged 2 weeks later with phenobarbital. Basic metabolic tests were all normal; therefore performing of molecular study was discussed with parents to establish the diagnosis. Figure 1. A, B, Brain magnetic resonance imaging (MRI) Transverse spin echo (SE) T2 weighted images at the level of midbrain and high parietal centrum semi-ovale demonstrated diffuse abnormal increased signal of deep and subcortical white matter. Note bilateral higher signal of anterior temporal subcortical white matter in T2 weighted image comparing deep white matter which suggests early cystic degeneration in these areas (white arrows). C, D, Coronal SE T2 weighted image and T1 fluid attenuated inversion recovery (FLAIR) sequences at the level of posterior limb of internal capsule and dentate nuclei indicated diffuse supra and infratentorial white matter increased signal in T2 weighted image which is respectively low in T1 FLAIR. Overall findings are consistent with severe demyelination of white matter. In his follow-up, truncal tone was improved with occupational therapy at the age of 6 months; however, he experienced frequent tonic seizures unresponsive to anti-epileptic drugs at 7 months of age. Therefore, the patient was admitted to pediatric intensive care unit (PICU) of our hospital for 1 month for better control of seizures. The patient was discharged from the hospital with oral phenobarbital, phenytoin and levetiracetam. By obtaining informed consent from parents blood sample of the patient was sent to laboratory for molecular studies. Two weeks later at the age of 8.5 months the patient was hospitalized again with decreased level of consciousness and 5 to 6 times of tonic seizures per day. Meanwhile, he experienced respiratory failure in PICU. Intubation was performed; followed by tracheostomy due to long term intubation. And now, at the age of 12 months, the patient is discharged from hospital and his seizures are under control by phenobarbital, topiramate, lamotrigine, and oxcarbazepine. His respiration is supported by mechanical ventilation through T-tube and oxygen therapy. The last systemic and neurologic examinations showed central hypotonia, microcephaly, dense cataract, global developmental delay and poor weight gain. The results of molecular studies at age 12 months showed the final diagnosis. Genomic DNA was extracted from peripheral blood using standard protocols. Coding regions and exon-intron boundaries were enriched using Agilent SureSelect Human All Exon 50 Mb (Agilent Technologies Santa Clara, CA) according to the manufacturer’s standard protocol. Sequencing was performed by targeted-next generation sequencing (NGS) analyzer on an Illumina, Hiseq4000 (Illumina, San Diego, California, USA). Burrows-Wheeler Aligner (BWA), GATK (https://www.broadinstitute.org/gatk/) software package and SAMTools were applied to align the reads using on reference genome (hg19), variant calling and for annotation. The variants were filtered based on their frequency (minor allele frequency < 0.1) in 1000 Genome ExAC (http://exac.broadinstitute.org/) and dbSNP and EVS (http://evs.gs.washington.edu/EVS/) databases. Some online software tools including Combined Annotation Dependent Depletion (CADD) (http://cadd.gs.washington.edu/), Polyphen2 (http://genetics.bwh.harvard.edu/pph2/), SIFT (http://sift.jcvi.org/) and MutationTaster (http://www.mutationtaster.org/). The standards and guidelines for the interpretation of sequence variants based on consensus recommendation of the American college of Medical genetics and genomics (ACMG) 2015 was also used to interpret the variants (4). The proband, his parents and sister were analyzed for the found variant using Sanger sequencing. Those variants that segregated with the phenotype within the entire family were considered pathogenic. A homozygous variant (c.922G > A) (rs372548739) was detected in EIF2B2 gene in exon 8 leading to an amino acid substitution (p.Val308Met). Sanger sequencing at position c.922 of his clinically asymptomatic parents revealed a heterozygous mutation but his sister was normal for this position; the segregation analysis confirmed the result. In addition, above mentioned software tools predicted this variant as disease causing. Frequent seizures were the main manifestation in this patient. As seizure occurrs in rare cases of infantile VWM, suspecting this type of leukodystrophy as a potential diagnosis in the early stage of the disease in this patient was not possible. To date, no specific algorithmic approach has been introduced for diagnosis of leukodystrophies. However, clinical scenario of individuals, imaging findings and MRI pattern involvement, and genetic tests are the three main dimensions for diagnosis. In this study, the most common clinical presentations of VWM were not observed in the early stage of the disease, but hypotonia. It took about 8 months after the first episodes of seizures until other clinical features; including microcephaly and cataract, were recognized. Up to now features like spasticity, ataxia and fever have not been observed. Although the overall clinical presentations were confusing and couldn’t lead to diagnosis, demyelinating pattern in MRI and reported homozygous mutation in EIF2B2 gene make the diagnosis of VWM definite. It is worth to mention that although genetic analysis is the most suitable modality for diagnosis of VWM and other types of leukodystrophies; its high cost and late response are the biggest challenges of its use. Therefore, to reduce the economic burden of diagnosis of leukodystrophies one should focus more on clinical presentations and imaging MRI findings as much as possible. To date only few cases of early onset VWD have been reported in whom frequent seizures have been prominent as clinical manifestations of the disease. These are listed in Table 1. In one study epilepsy occurrence coincided with various other manifestations of VWD (5); yet another one reported seizure as the only clinical manifestation (6). Like our study, 2 of these trials reported mutations in EIF2B2 gene. However, the DNA levels of mutation were different. Leng et al. (7) reported a patient with a compound heterozygous mutation in EIF2B2 gene that caused by c.254T4A, p. Val85Gly mutation in father and c.922G4A, p.Val308Met mutation in mother; however, homozygosity of the mutations in our patient is due to consanguineous marriage of his parents. Takano et al. (2) A 4 month-old girl who developed lethargy, vomiting and seizure as well as rapid neurological deterioration. Two heterozygous mutations in the EIF2B5 gene (c.584G > A and c.1223T > C). Hata et al. (8) Physical and mental development of a boy began to deteriorate after convulsions at 10 months of age. A marked decrease in volume of white matter, with no typical cystic rarefaction was observed. Submicroscopic deletion of 14q24.3, which included EIF2B2 and a missense mutation of EIF2B2 (V85E) of the remaining allele. Shimada et al. 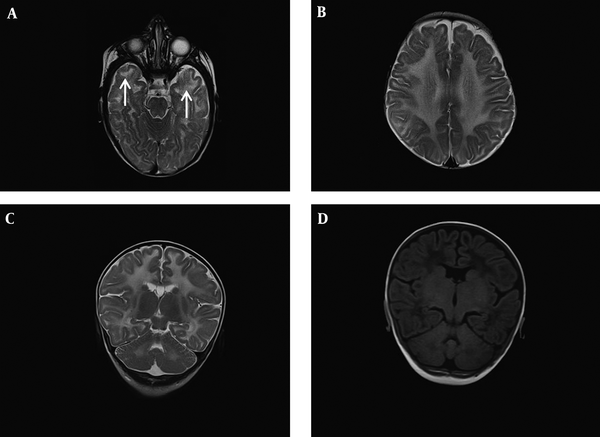 (5) A 2-year-old boy with progressive developmental deterioration associated with intractable epilepsy at 11 months of age, which was triggered by recurrent acute infectious diseases. Small palpebral fissures, bushy eyebrows, ear abnormalities, small upturned nose, downturned corners of the mouth, and micrognathia were other identified characteristic features. Deletion at 14q24.3 that included EIF2B2. The study was approved by ethics committee of children’s hospital center, pediatric center of excellence. Infantile type of VWD in association with some types of childhood leukodystrophies including type I Alexander disease, Aicardi-Goutieres syndrome, Canavan disease and Krabbe disease (9) can be considered as those leukodystrophies of pediatric population that are associated with early onset seizures in their clinical manifestations. We thank the patient’s parents for their kind cooperation and the nursing personnel of our PICU for altruistic medical care of the patient. 1. Ashrafi MR, Rezaei Z, Heidari M, Nikbakht S, Malamiri RA, Mohammadi M. The First Report of Relative Incidence of Inherited White Matter Disorders in an Asian Country Based on an Iranian Bioregistry System. J Child Neurol. 2018;33(4):255-9. doi: 10.1177/0883073817751804. [PubMed: 29333903]. 2. Takano K, Tsuyusaki Y, Sato M, Takagi M, Anzai R, Okuda M. A Japanese girl with an early-infantile onset vanishing white matter disease resembling Cree leukoencephalopathy. Brain Dev. 2015;37(6):638-42. doi: 10.1016/j.braindev.2014.10.002. [PubMed: 25457085]. 3. van der Knaap MS, Pronk JC, Scheper GC. Vanishing white matter disease. Lancet Neurol. 2006;5(5):413-23. doi: 10.1016/S1474-4422(06)70440-9. [PubMed: 16632312]. 4. Richards S, Aziz N, Bale S, Bick D, Das S, Gastier-Foster J. Standards and guidelines for the interpretation of sequence variants: a joint consensus recommendation of the American College of Medical Genetics and Genomics and the Association for Molecular Pathology. Genet Med. 2015;17(5):405-24. doi: 10.1038/gim.2015.30. [PubMed: 25741868]. 5. Shimada S, Miya K, Oda N, Watanabe Y, Kumada T, Sugawara M. An unmasked mutation of EIF2B2 due to submicroscopic deletion of 14q24.3 in a patient with vanishing white matter disease. Am J Med Genet A. 2012;158A(7):1771-7. doi: 10.1002/ajmg.a.35431. [PubMed: 22678813]. 6. Gungor O, Ozkaya AK, Hirfanoglu T, Dilber C, Aydin K. A rare mutation in EIF2B4 gene in an epileptic child with vanishing white matter disease: a case report. Genet Couns. 2015;26(1):41-6. [PubMed: 26043506]. 7. Leng X, Wu Y, Wang X, Pan Y, Wang J, Li J. Functional analysis of recently identified mutations in eukaryotic translation initiation factor 2Bvarepsilon (eIF2Bvarepsilon) identified in Chinese patients with vanishing white matter disease. J Hum Genet. 2011;56(4):300-5. doi: 10.1038/jhg.2011.9. [PubMed: 21307862]. 8. Hata Y, Kinoshita K, Miya K, Hirono K, Ichida F, Yoshida K. An autopsy case of infantile-onset vanishing white matter disease related to an EIF2B2 mutation (V85E) in a hemizygous region. Int J Clin Exp Pathol. 2014;7(6):3355-62. [PubMed: 25031760]. 9. Ashrafi MR, Tavasoli AR. Childhood leukodystrophies: A literature review of updates on new definitions, classification, diagnostic approach and management. Brain Dev. 2017;39(5):369-85. doi: 10.1016/j.braindev.2017.01.001. [PubMed: 28117190].